Many of the 1967 and 1968 had the "large style" Oil Pressure Sending Unit with a spade type of slide on connector. 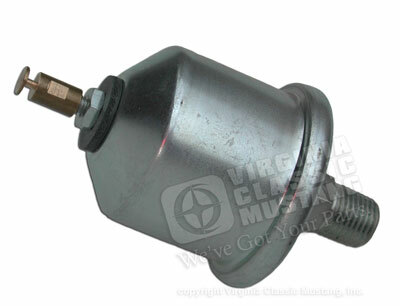 All of these larger sending units are only available with a threaded stud style end. We now have a brass adaptor that is fitted on the end of this sending unit as pictured above. It is sold as a complete unit with the adaptor installed. Our part number for this new part is EG1741.